Putting Tips: Are you linear or Non-linear? Putting is one of the simplest strokes in golf, but causes fits for every golfer that has played the game. If you struggle reading putts, aiming your putter, or making putts between 5 and 15 feet, this post is for you! One of the greatest tips I’ve received about putting came during the winter of all times. One of my buddies had just taken a lesson from “Golf Digest Top 100” teacher, Mike Shannon, and shared what he learned with me. Mike is known for his putting instruction, but of course, I was skeptical at first. The ten minute impromptu lesson that I received on that cold December afternoon changed my putting dramatically. When I would try to line up my golf ball to my target (you know, the sharpie line that you see rolling end over end on the PGA Tour? ), I could never get comfortable! I consciously knew that I was lined up at the correct target, but it felt so weird! Every time I would line up to a putt, it felt as if I were lined up 5 feet right of the target. I often wondered the best way to read the greens. I searched through Golf Digest, YouTube, etc., but I kept getting two contradictory answers… Some instructors would recommend seeing a straight line, while others would recommend seeing a curved line. Yes, I am a bit OCD when it comes to golf, but that is beside the point. In the next few minutes, you will learn the lesson that helped fix these problems for me. I hope they can help you as well! I’ll be brief, but I wanted to just give a general overview of what this post is about. The purpose of this post is to determine what type of putter you are, and how to use your putter “archetype” to your advantage! You will learn the difference between what Mike Shannon calls a “linear” or “non-linear” putter. In reality, we are discussing how your brain interprets visual stimuli while on the putting green. So, am I linear or non-linear? I will try my best to explain the method for figuring this out, but it might be easiest to just watch Mike Shannon explain it here. If you watched the video, you might be wondering if it is necessary to buy the laser aimer shown in the video. I wouldn’t recommend it, because there is a much more cost effective way to see where your putter is aimed. If you’d like to see where your putter face is aimed, have a friend place a credit card perpendicular to the putter face, step away from the ball, and look where the card is aimed. It isn’t perfect, but it will accomplish our goal here. Find a left to right breaking putt (it doesn’t matter what type of breaking putt you choose, but for the sake of my explanation, I am assuming a left to right putt). Roll the ball a few times to figure out the break for the putt. Now, place a tee next to the hole where you need to aim. Place the ball down on the ground without using any alignment aids, and try to aim your putter at the tee that is left of the hole. Now, keeping the putter still, have a friend remove the ball and place the credit card against the putter face. Where is the credit card aimed? If it is aimed significantly left of the tee, you are a “non-linear” putter. If you are aimed close to the tee, you are a “linear” putter. So how does this work? From my understanding, if you are linear, you are able to aim at the tee, because you putt in straight lines. If you are non-linear, you won’t be able to line up to the tee, because your brain subconsciously registers that the putt is a left to right breaking putt, so you naturally aim left of your straight-line-target to compensate. **Also note that the “aimpoint” refers to the spot you should aim assuming you are hitting the ball with optimal speed. If you die your putts, or charge them in the back of the cup, your aimpoint will vary slightly. Where are my linear putters at? If you are a non-linear putter, you don’t have to read this section, and I advise you skip down to the next headline. If you are a linear putter, listen up! I’m going to provide you with some strategies for improving your green reading, alignment, and putting method in general. As a linear putter, you will want to experiment with different techniques until you can find the “apex” of the putt consistently. There is no correct way to read a green, so I suggest you do some research and spend some time on the practice green! As a linear putter, you will probably benefit from drawing a sharpie line on your ball, and lining this up to an intermediate target somewhere on that straight green line shown in the photo above. As a linear putter, you will probably putt best picking a straight line to hit the putt on, and trying to hit the ball the appropriate speed on that line. You could also consider picking an intermediate target (a pitch mark or discoloration in the green on your aim line), which will help you aim the ball up a bit easier. How about my Non-Linear Putters? As a non-linear putter, you will find yourself focusing less on any specific line, and more on the path the ball will take. Keegan Bradley imagines his ball burning a red laser line through the green on the path he wants it to roll. I love this visual analogy, and often use it myself. 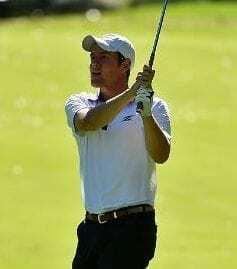 I’m a very curve orientated golfer. I visualize all my shots curving to the target, and although you can’t draw or fade a putt, the same visualization helps me to read putts. I imagine myself tossing a ball at the apex of the putt, and watching it break into the hole at a certain point. I like to focus in on the last few feet of the putt to see where that ball is going to drop into the hole, and at what speed. Below is a photo which represents how I visualize the hole. I’ll pick a spot on the clock, and remember that spot so that I can aim correctly at address. This might sound crazy, but I aim at the hole! I step into the putt and line my putter face up until it feels like the ball will enter the hole at the spot that I have chosen on the “clock.” My biggest key is trusting my line, and trusting that my brain is capable of calibrating the putter face to aim on that line. If you want to use the line on the ball still, that is totally fine as well. Personally, I use the line for all of my short putts that do not break much, while abandoning it for longer putts. There is no one way to do it. Find what works, and stick to it. As a non-linear putter, rather than using a bunch of practice aids, I suggest that you practice making the same putt at several different speeds. This will allow you to visualize the curve and the speed of a putt much better. I’m not sure what happened to the last putt… I promise it went in! 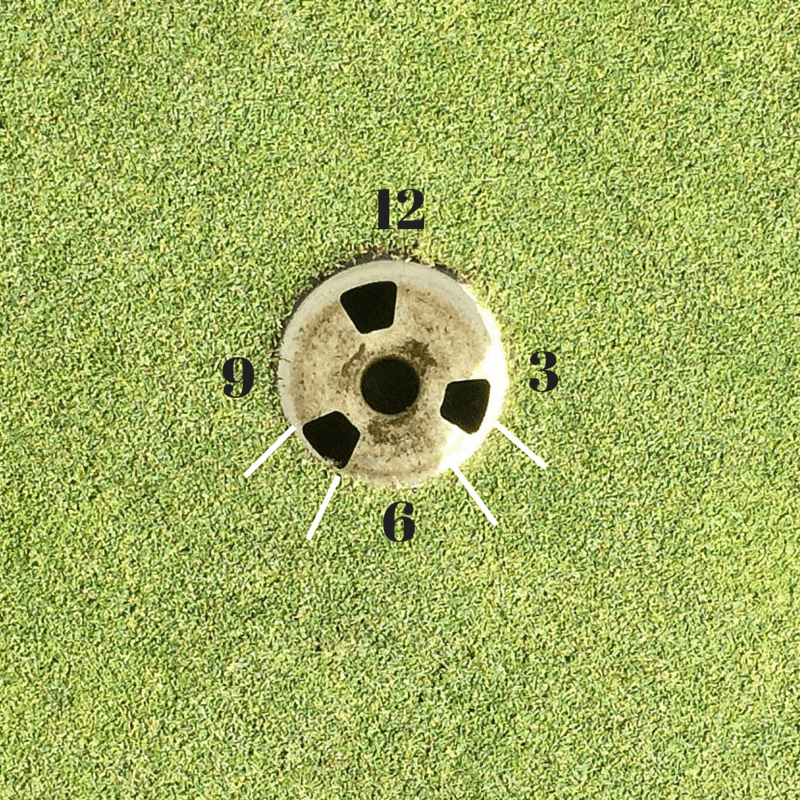 As a non-linear putter, you might find it helpful to visualize the ball entering your desired point on the clock with the correct speed immediately before hitting the putt (on your last look). I know this post has been a thorough one, but I didn’t want to miss anything that would create confusion if left out. Anyways, determining your putting type can be a tremendous help in figuring out how to practice, and how to putt on the course. Like any theory, there is criticism that can be found all over the internet, including Geoff Magnum’s review of the system here. Geoff is a brilliant guy when it comes to putting, and definitely has some good things to say. He disagrees with the “linear/non-linear” system in the review, but I still believe it might help golfers in general. Knowing what type of putter I am has significantly dropped my putts per round, and I find myself stressing less with my putting every day. I hope it does the same for you.